I have to say I think the man that owns the building has done ALOT of improvement on the once delapadated building...he also has improved that community by allowing the Police substation to be there...I have noticed in the last couple of months ....a HUGE improvement in the neighborhood ie: the prostitution that was once there is NO longer there as well as the DRUG houses...I believe that the owner should get a round of applause!! I am the owner of the former Wright's Machinery Building located at 921 Holloway Street in Durham, NC. My father, William W. Yarboro worked at the plant for over 30 years. He died in 1989. I purchased the building in 2002 to preserve and protect the legacy of thousands of men and women who worked there. These people made such a tremendous contribution to Durham, our beloved country during the dark days of WWII, and later in early days of NASA and space exploration. I have started a museum inside the building and would love to show this to visitors. My company's corporate offices are located in the building. I feel very blessed and honored to work in the same building that was such a big part of my father's life. I love it when former employees stop by and relive their years and experiences of the plant. Please feel free to drop by for my history lesson about the plant, or the see the museum. Today, with recommendation from the staff of the NC State Historic Preservation Office, the North Carolina National Register Advisory Committee voted to approve the nomination of Wright's Automatic Machinery Company to the National Register of Historic Places. While it will take several weeks for the National Park Service to render their ultimate decision, nearly all nominations forwarded to the NPS by the state HPO are approved by that federal agency. This property will likely soon be eligible under the historic rehabilitation tax credit program, enabling the owners to continue their work of preservation and renovation. That is WONDERFUL news....Im sure the owner will be delighted...HOW AWESOME!!! My deceased brother, Sergeant Johnny Williams, Jr. worked for Wright Machinery back in the 70's. Fine young man. Remember Him? My sister, Helen, worked at Wright Machinery during WW2. It was rumored that they were building components for Norden bombsights. those times and how our country all came together to win the war. Yarbrough Mill, ~1925 - looking northwest from Calvin St. The Yarbrough Mill, a hosiery mill, was established on Calvin St., near Holloway St. around 1925. There is very little extant detail about the origin or operation of the mill. 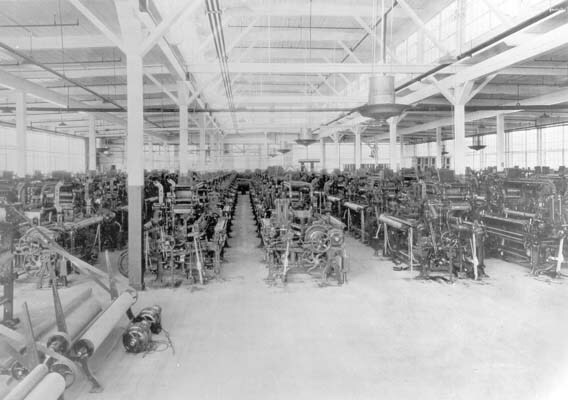 Yarbrough Mills interior, undated, but mid to late 1920s. By 1929, the mill was out of business. In 1930, the building was taken over by Richard Wright's Automatic Tobacco Packing Machine Company. The name of the company was soon changed to Wright's Automatic Machinery Company. During World War II, the company, again renamed as Wright Machinery Company, worked with the Sperry Corporation to manufacture "gun-fire control instruments for the US Navy." The large plant at Holloway St. was constructed for this, and employment peaking at more than 1000 people during the war. One previous commenter has posited that is the plant manufactured triggering mechanisms for bombs during the war. The plant received "four of the coveted Nacy 'E' awards for efficiency" during the war. Bird's eye view of the entire plant, looking northwest from above Holloway and Calvin St. Goose Creek winds along the western edge of the plant. By the 1950s, the company was run in part by Richard Wright's nephew, a vice-president - also named Richard H. Wright. 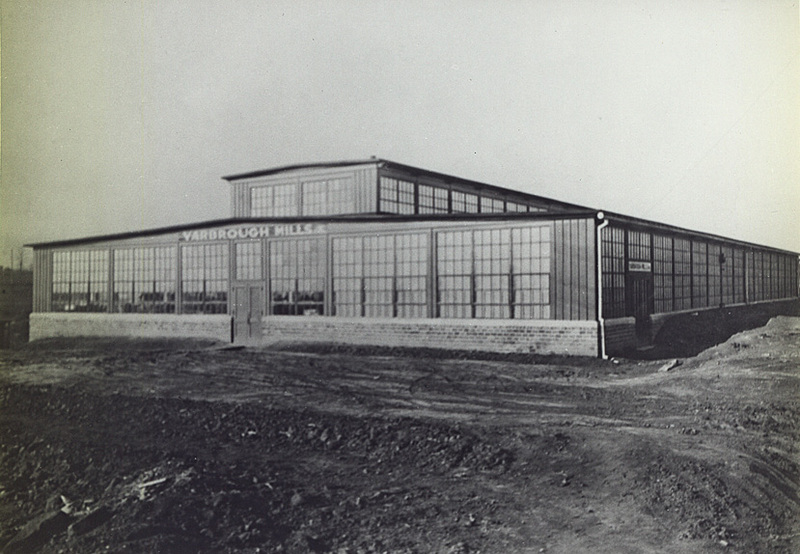 After the war, the plant had returned to manufacturing packing and wrapping machinery. Undated, but 1950s view of the rear of the new building - looking southwest. 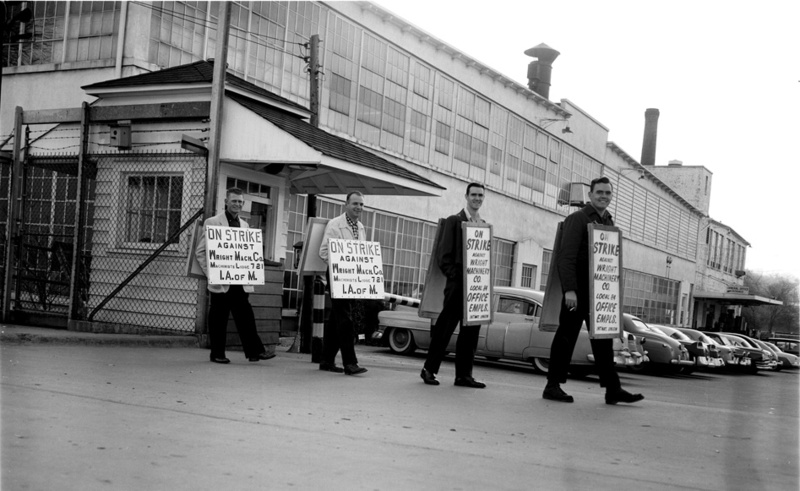 Strikes occurred at the plant in 1956. Looking southwest at the 1940s building. Looking northwest at the original Yarbrough Mills building. The company was still active at the Calvin & Holloway location into the mid 1960s. Looking east from near Goose creek, between the two buildings, 1966. 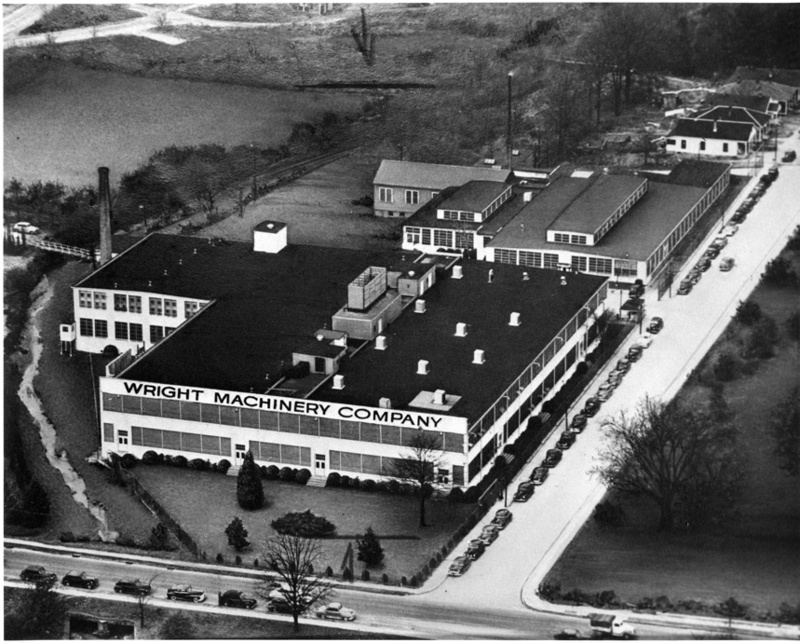 In 1969, the Wright company moved to Camden Avenue. 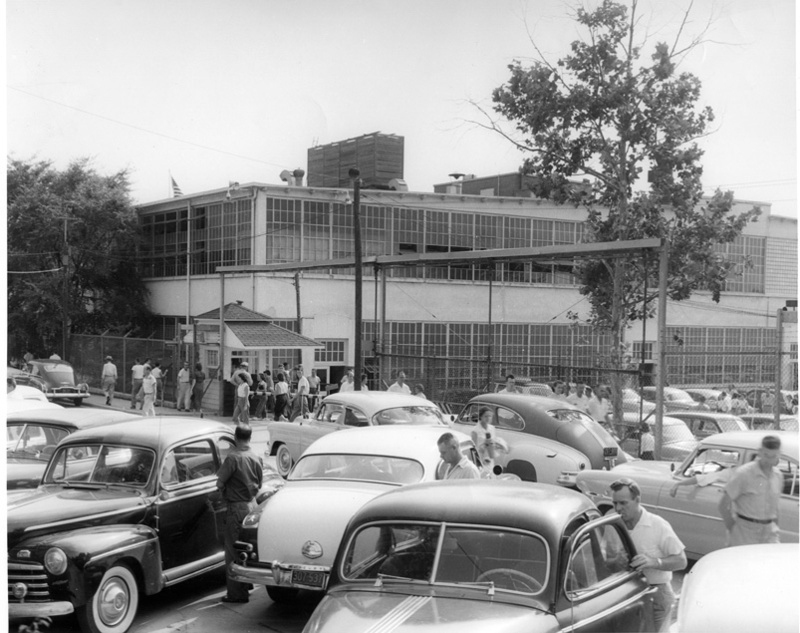 The building was occupied by former wartime partner Sperry-Rand Electronics Corporation into the 1980s. In the 1990s, the building was occupied by Honeywell, Inc. Sometime between ~1970 and 1994, the original Yarbrough Mills building on Calvin St. was demolished. It is currently owned by "Yarboro & Hesee Warehouses, LLC". The city agreed in November 2008 to lease ~16,000 square feet of space in the warehouse for the District One police substation, which will include both the District One staff, and the community services division. Looking northwest from Calvin and Holloway at the front of the 1940s structure, 01.11.09. Some very large Magnolia trees that once graced the front of the building have been removed recently. Looking northwest from Calvin St. at the former location of the older, Yarbrough Mills building. This location is a vast improvement over the previous location, a sorry shopping center on Holloway St., east of 70. It may have provided office space, but did not contribute to a sense of community commitment to the inner neighborhoods of Edgemont/Cleveland-Holloway, and East Durham. The proximity to Housing Authority, City, and private investments - as well as adjacency to Long Meadow Park - is a strong positive move by the city and the police department.